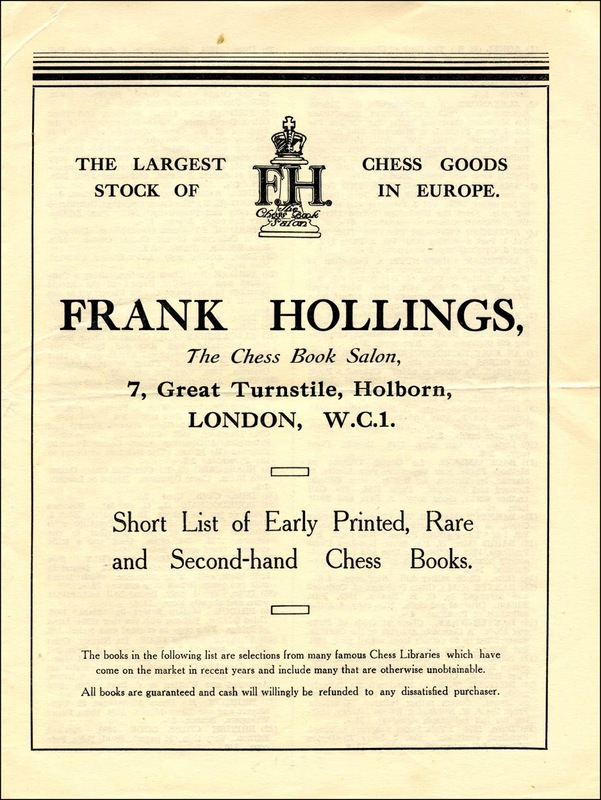 Frank Hollings was the trading name of the bookseller and publisher James Francis Hollings Shepherd (1844-c1905), who opened his bookshop at 7, Great Turnstile, Holborn, London in 1892. 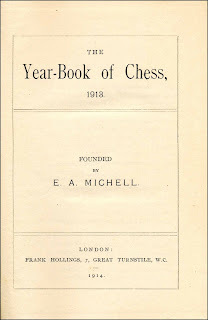 The shop specialised in chess literature and issued frequent catalogues of chess works. 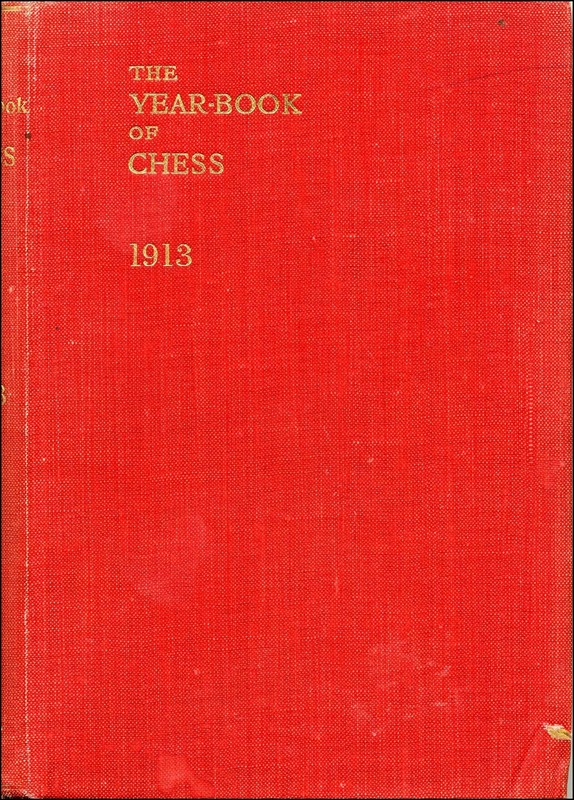 Betts 1-21 records Catalogue of Works on Chess, Draughts and Whist, No. 28, dated 1899, and this listed 342 items. 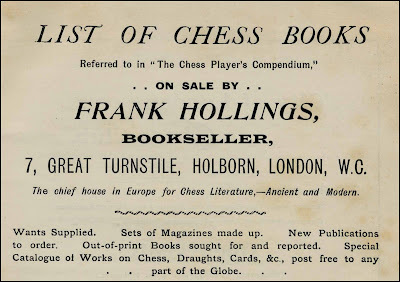 The business claimed, in 1910, to be The chief house in Europe for Chess Literature, Ancient and Modern and in the 1930's to have The largest stock of chess goods in Europe. J.F.H. 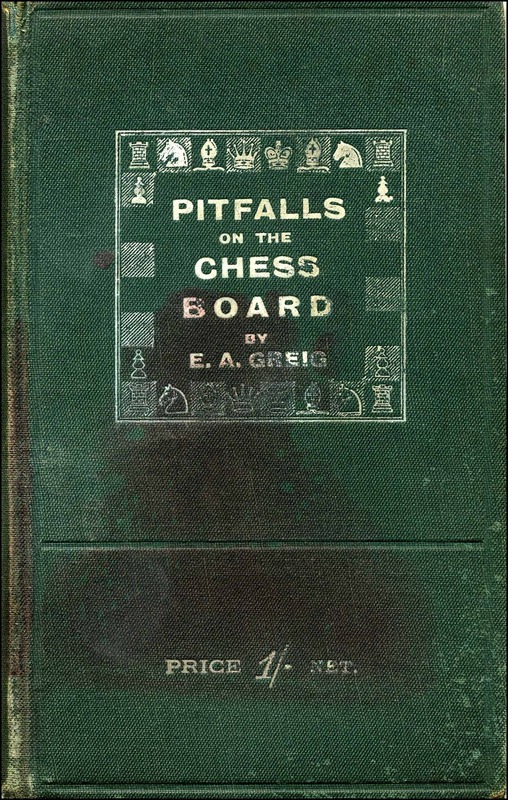 Shepherd died circa 1905 and the business was taken over by William Edward Redway, a fellow chess enthusiast, who soon began publishing works on the game. 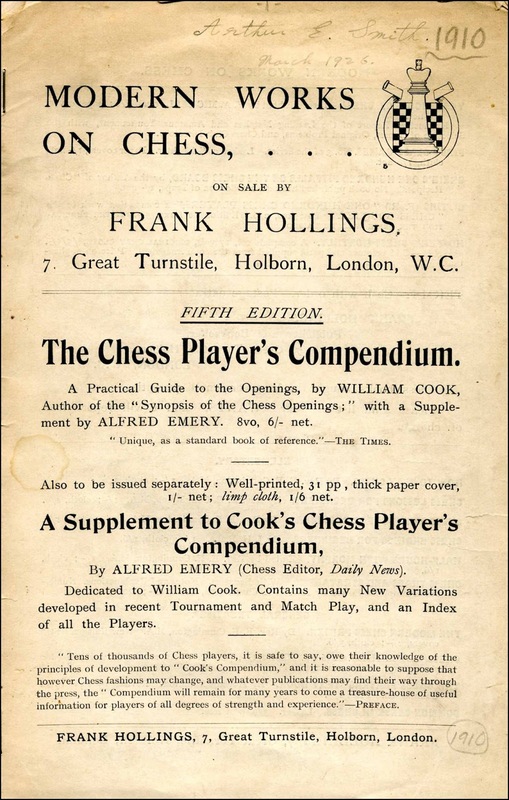 Comprehensive information regarding the proprietors of Frank Hollings, Shepherd and Redway, can be found at the Chess Notes website and here I am discussing the early chess publications produced by the firm up to 1920. 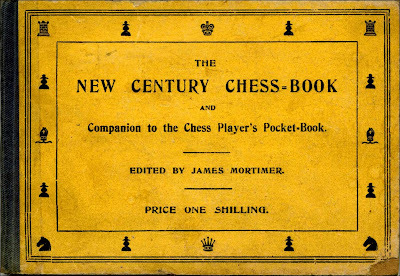 The first two chess books published were both by James Mortimer; The Chess Players' Pocket-Book and Manual of Openings, 15th edition, London, 1906 and The New Century Chess Book and Companion to the Chess Players' Pocket-Book, New and Enlarged Edition, London, 1906. The latter work included considerable analysis of the Rice Gambit and was regarded as the second edition of books in the Rice Gambit series. 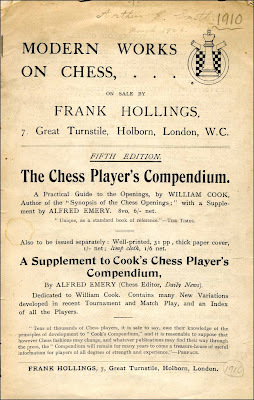 Frank Hollings took over the publication of The Chess Players' Compendium, by William Cook, for the 4th edition, London 1907 and 5th edition, London 1910, and also published A Supplement to Cook's Chess Players' Compendium by Alfred Emery, London, 1910. 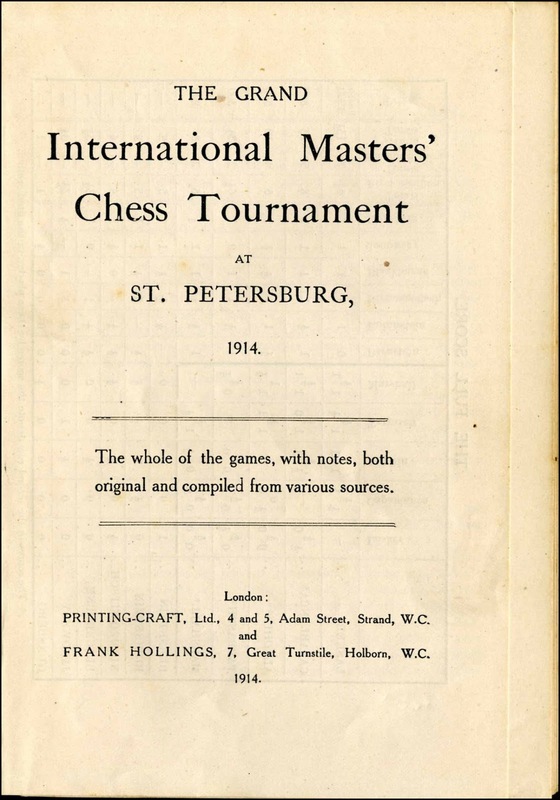 This supplement included openings and games played since the publication of the first edition of the Compendium in 1902, and was incorporated into the fifth edition. No. 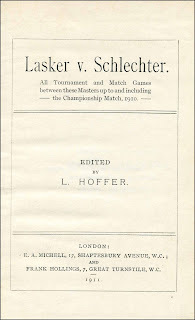 1 The Match and the Return Match Janovsky v Marshall, London, 1908, covering the two matches between these players in 1905 and 1908. No. 2 The Championship Match Lasker v Tarrasch, London, 1908. No. 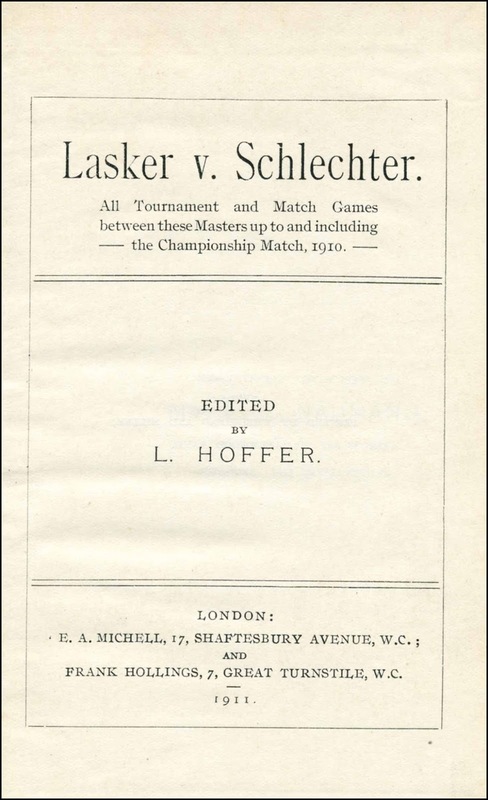 3 Lasker v Schlechter, All Tournament and Match Games between these Masters up to and including the Championship Match, 1910, London, 1911. 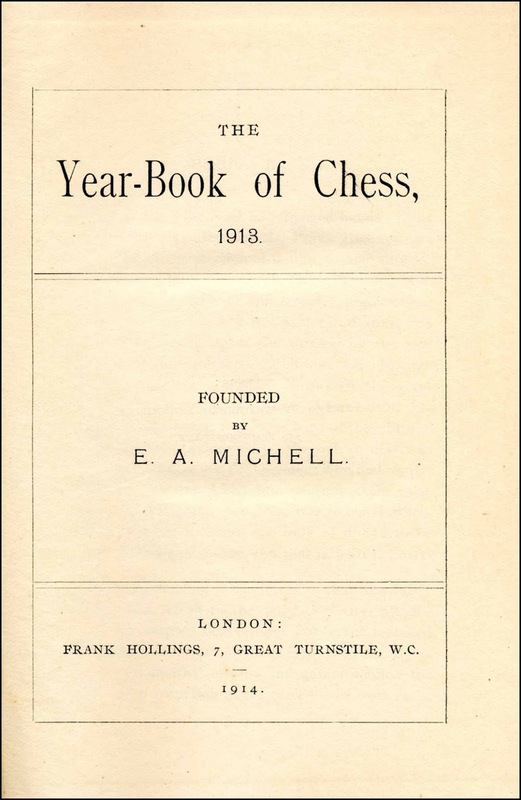 Frank Hollings also became joint publisher, with the editor E.A.Michell, of The Year-Book of Chess for 1909, and this partnership continued with the Year-Books for 1910, 1911, and 1912. Frank Hollings was the sole publisher of the Year-Books for 1913, 1914 (now edited by M.W.Stevens), and the combined annual for 1915 and 1916 which was edited by W.H.Watts and A.W.Foster. 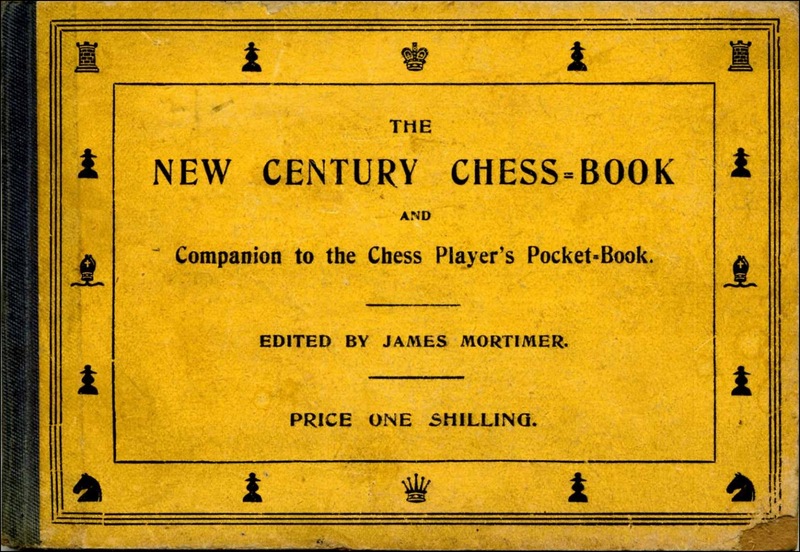 and the 16th edition of James Mortimer's The Chess Players' Handbook and Manual of the Openings, London, 1917, which was previously published as The Chess Players' Pocket-Book and Manual of the Openings. Frank Hollings is also credited as publisher/distributor of Goh or Wei Chi by Horace F. Cheshire, Hastings, 1911. 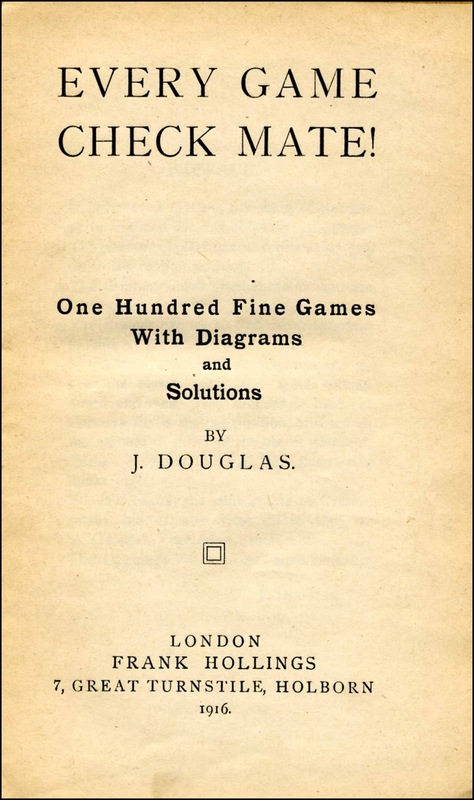 In a 1930's catalogue Frank Hollings describes this game as `The Probable Origin of Chess and Draughts´, however, H.J.R Murray states that this game is much more likely to be a derivative of chess in A History of Board-Games Other than Chess, Oxford, 1952, pages 36 and 90. 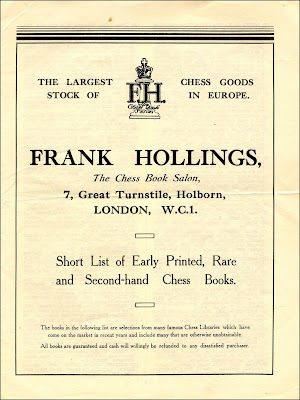 I hope to complete the chess publishing history of Frank Hollings in a future article. 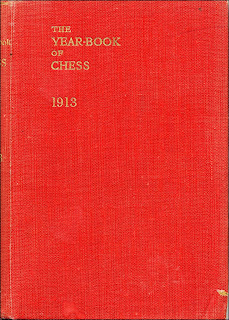 The Unknown Alekhine 1905-1914 by Fred Reinfeld, published by Pitman, London, 1949 and The Unknown Capablanca by David Hooper and Dale Brandreth, published by Batsford, London, 1975, are both very well known and highly regarded chess books. Much less known is The Unknown Tal, Selected Games of World Champion Mikhail Tal 1951-1956 by Valdemārs Zemītis, published in cooperation with The California Chess Reporter, San Francisco, 1960. 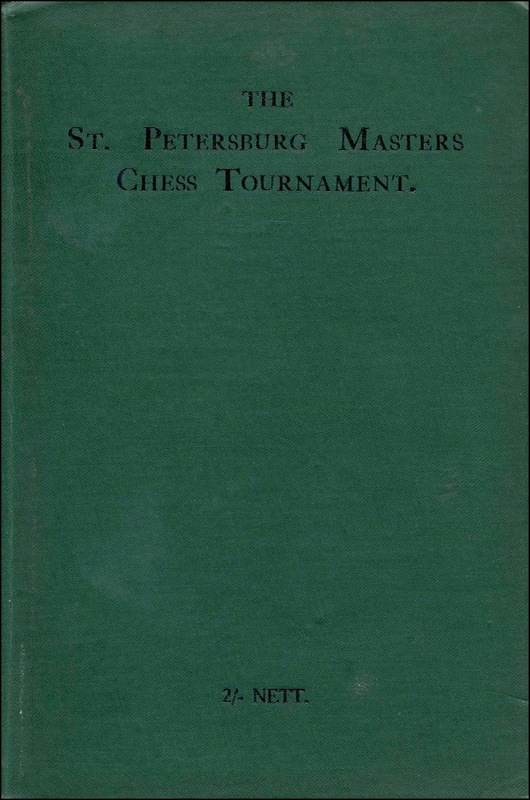 Several books featuring Mikhail Tal's games were published following his World Championship success against Botvinnik in May 1960 and The Unknown Tal was the first collection of Tal's games published in English. Valdemārs Zemītis, the Latvian Chess historian, emigrated to the USA in 1951, eventually settling in California. 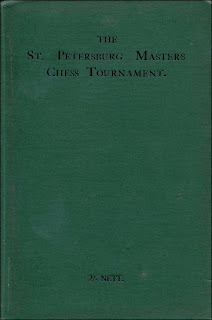 A biography of Zemītis by John Donaldson can be seen on the US Chess Federation website. 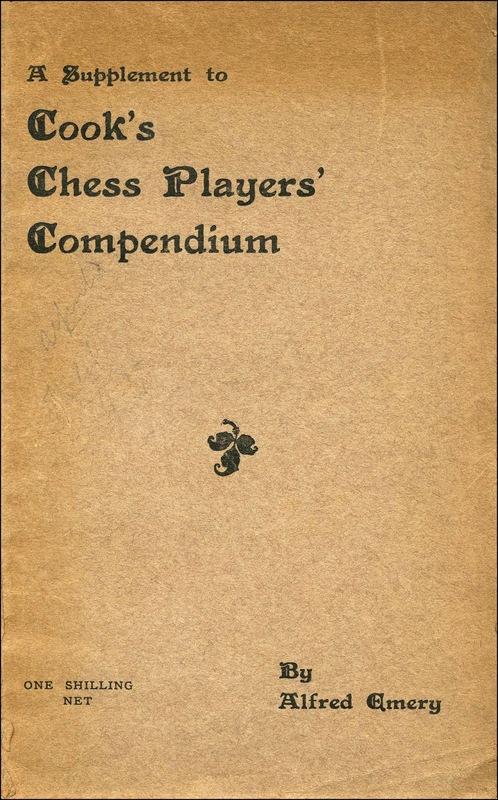 Donaldson states that The Unknown Tal was produced with the assistance of Bob Burger (although this is not mentioned in the book) and I assume this is Robert E. Burger author of The Chess of Bobby Fischer, Radnor, Pennsylvania, 1975. Zemītis also produced, with J. Vitomskis and others, the Encyclopedia of Latvian Chessplayers, 2009, a two volume work of over 800 pages. 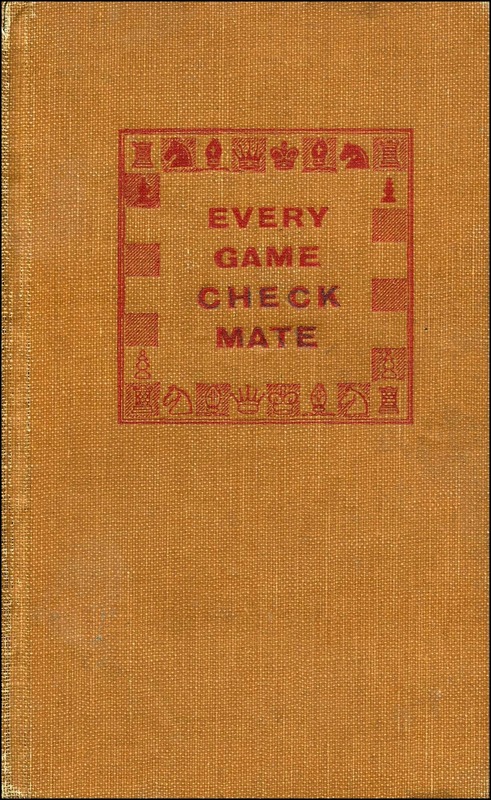 The Unknown Tal was printed in a limited edition of 500 copies and includes 33 of Tal's early games from 1951, when he was just 15, up to 1956. Some of the analyses are by Tal and there are indexes of games, openings and opponents. Percy Wenman, prolific chess author. 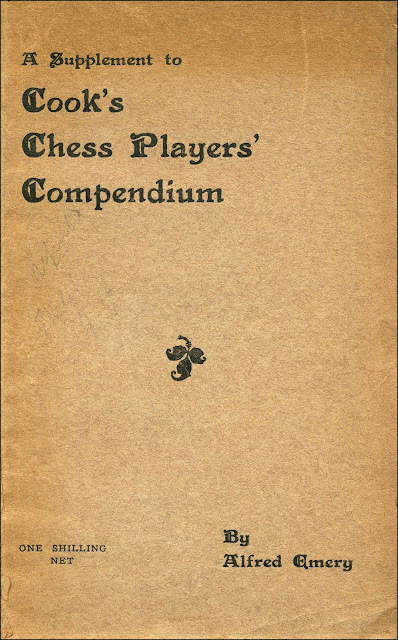 Francis Percival Wenman (1891-1972) was a very prolific author of chess books producing 21 titles from the late 1930's to the early 1950's. 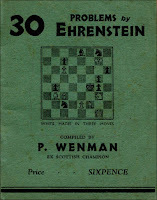 Wenman was a problem composer and Scottish Chess Champion in 1920, and some details of his chess career, compiled by Alan McGowan, can be seen at the Chess Scotland website. 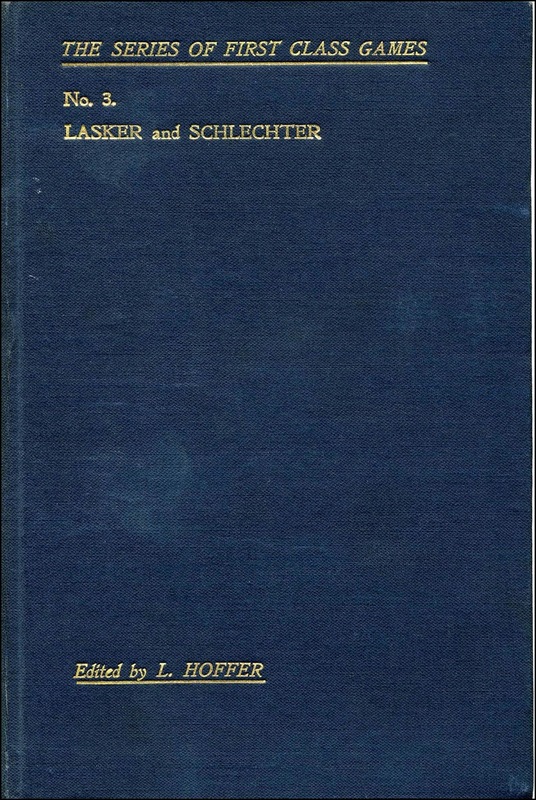 He was not a highly regarded author and earned a reputation for plagiarism in respect of his chess problem books, however, here I am concerned only with his literary output from a purely bibliographical viewpoint. 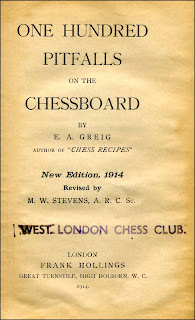 Wenman's first chess book was One Hundred Remarkable Endings, Bristol, December 1938. This was more of a middle game book according to Betts 20-9, comprising 100 positions mostly with a combinational continuation. 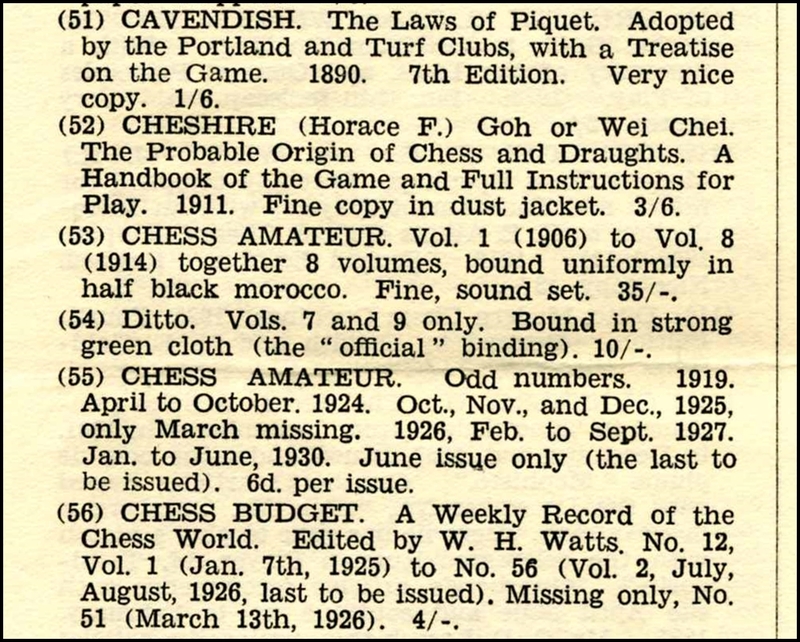 Six months later this was followed by One Hundred Chess Gems, London, June 1939.
and his final book Master Chess Play, London 1951, a collection of 106 annotated games, mainly pre-1910. 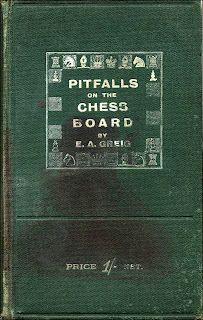 and in 1948 he brought out two books in a series on Great American Chess Players: 1. Frank J. Marshall and 2. H. N. Pillsbury. The Marshall book includes a five page Biographical Note, Marshall's Record in Tournaments and Matches, 99 annotated games and one position for the reader to analyse. The Pillsbury book also has a five page biography which, intriguingly, is dated 1st January 1947, followed by 100 lightly annotated games including 35 played blindfold. 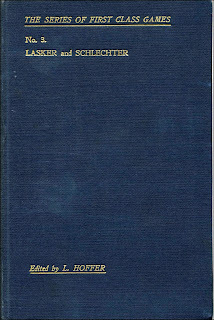 No further books in the series were produced. Problems and Puzzles, Leeds, 1943. One Hundred Published Problems, Leeds, 1944. Thirty Chess Problems, Leeds, 1945. Two Hundred Assorted Problems, Leeds, 1945. 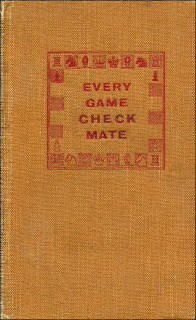 Thirty End Games by Horwitz, London, 1946. 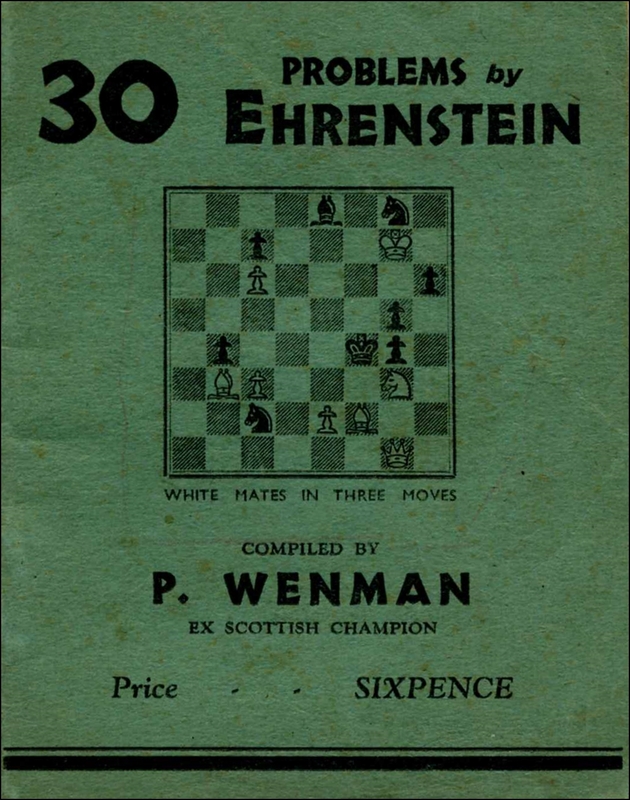 Thirty Problems by Ehrenstein, Leeds, 1946. Thirty Problems by Guidelli, London, 1946. Six Hundred Problems, Ancient and Modern, Liverpool, 1948. All of these "Thirty" books are in very small format measuring just 12cm. x 9cm. 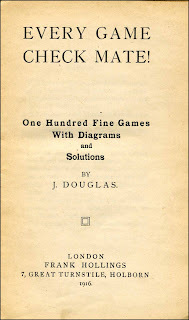 One Hundred and Eleven Selected Problems/One Hundred Remarkable Endings/Two Hundred Assorted Problems/One Hundred Published Problems, Leeds, 1945. Two Hundred Assorted Problems/One Hundred Published Problems/One Hundred Remarkable Endings/Fifty Two-Move Problems, Leeds, 1946. Problems and Puzzles/Two Hundred Assorted Problems/One Hundred Published Problems/One Hundred and Eleven Selected Problems/Fifty Two-Move Problems, Leeds, 1944-45. 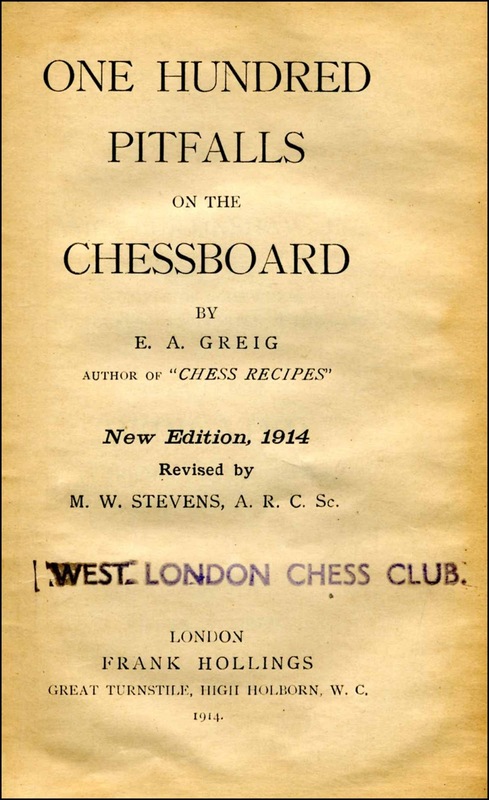 Wenman liked to include lists of books that he had authored on title pages and, mysteriously, a book with the title Masterpieces of the Chess Board appears in these lists in at least ten of his books, but no work with this title exists. 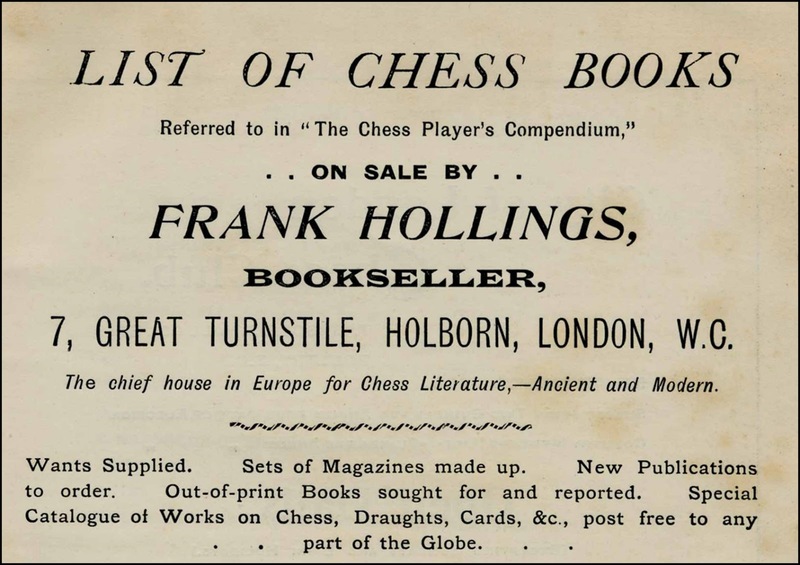 There are also adverts at the back of some books, for example, Fifty Two-Move Problems, sixth edition, and Gems of the Chess Board, fifth edition, which include Masterpieces of the Chess Board. 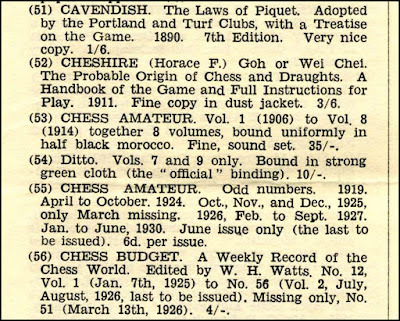 Note that the advert in Gems of the Chess Board also includes the title One Hundred and Fifty Chess Brilliancies which no doubt was published as One Hundred and Seventy Five Chess Brilliancies but Masterpieces of the Chess Board appears not to have been published with this or any other title. 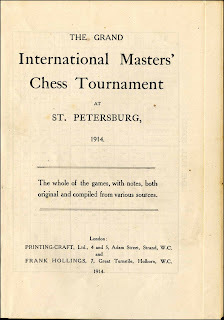 Another curiosity is that several title pages with publication dates of 1945 or 1946 list, among Wenman's other works, One Hundred and Seventy Five Chess Brilliancies which was not published until 1947. Perhaps the books were reprinted at a later date without amending the title page date.